This section is intended to assist researchers and others interested in details. Helpful additions are welcome. This British map from 1776 shows some troop and ship positions. Of three known versions, this one contains the most detail. It shows the floating bridge ordered by General Lee to connect Sullivan’s Island to the mainland (which did not work). 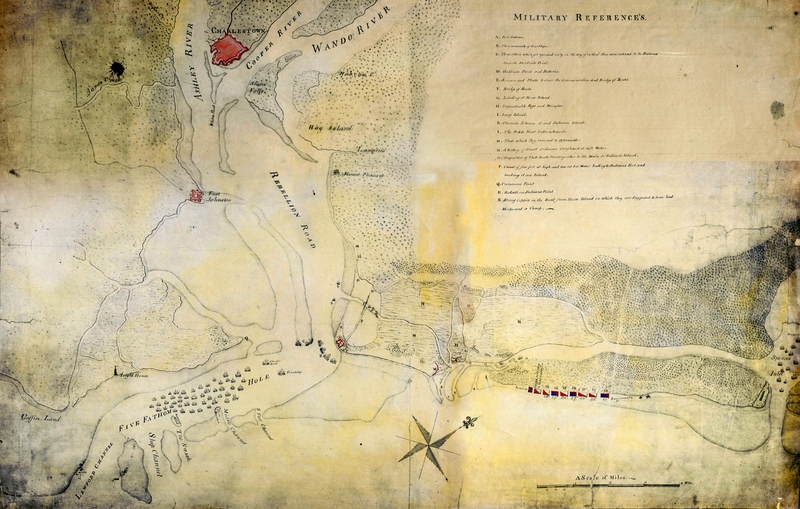 It depicts the British positions on the oyster bank, north of Colonel Thomson’s batteries. It also notes that sandbars in Breach Inlet are dry at low water. 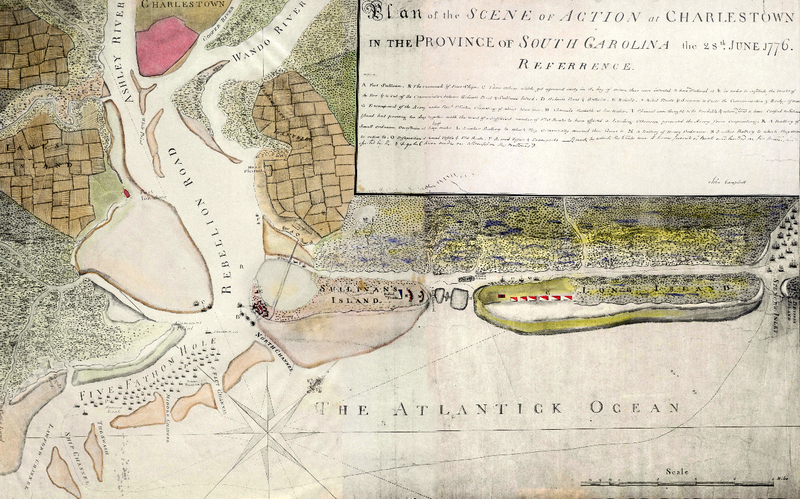 This 1780 map presents an excellent overview of the Charleston area as well as fine details. Zoom to Breach Inlet to see likely locations of forces, depths of creeks, etc. The following two maps from General Clinton’s collection contain details not shown in other period maps. 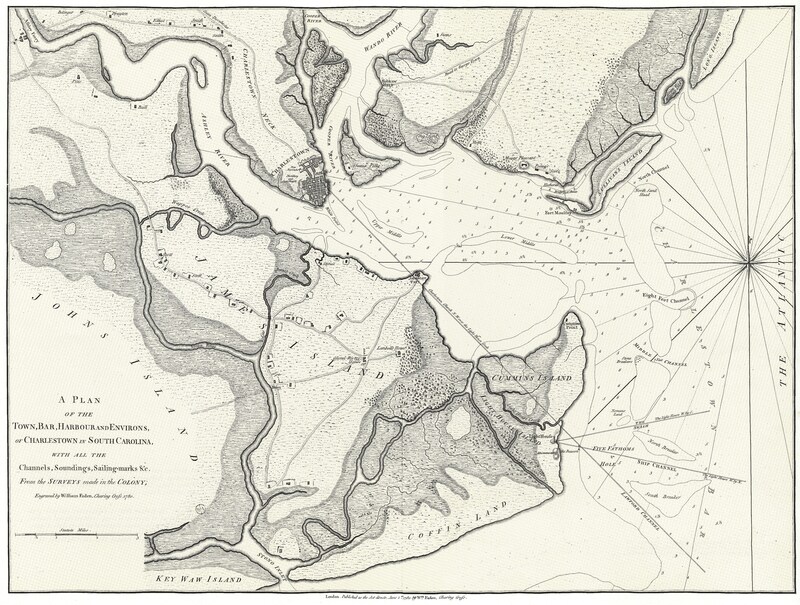 Note the oyster bank redoubts, potential landing site on the mainland, and disposition of troops and boats. 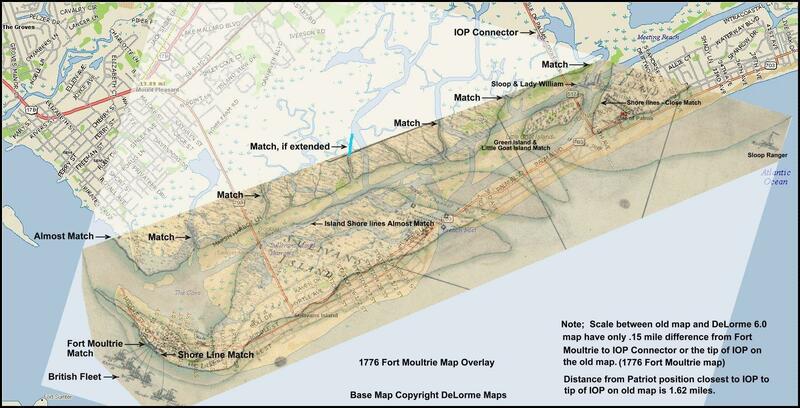 This overlay shows how Breach Inlet has changed over time, courtesy of Jack Parker. The following two Google Earth Images locate approximate spots from the battle on a modern map. 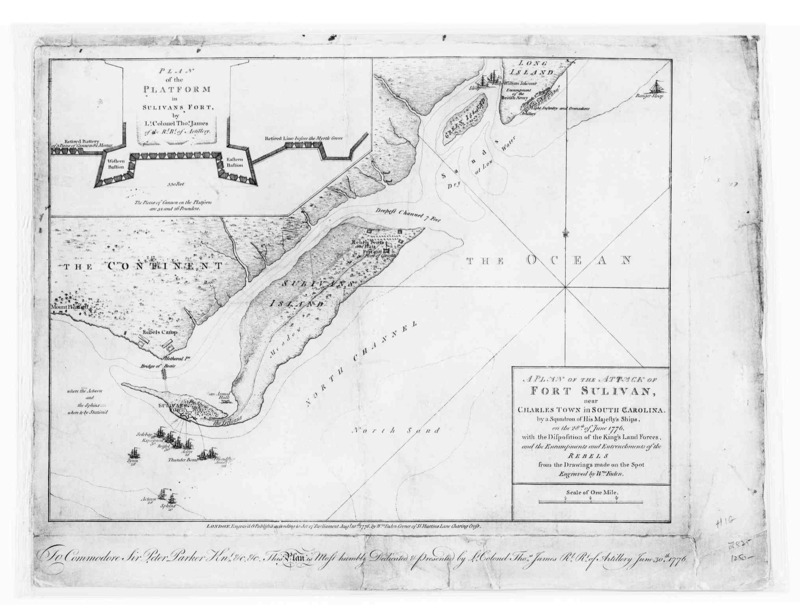 On the first map, note Bolton’s Landing on the mainland, three miles from the Patriot encampment at Haddrell’s Point. This landing may have been used by both British and patriot scouting parties. It was the site MG Clinton would have used for an attack or diversion on the mainland from Long Island via today’s Inlet Creek. The following image zooms to Breach Inlet. Note the site of the British artillery emplacements on oyster banks. Today, this high ground 4/10 mile from the shore of Sullivan’s Island is known as Clubhouse Point. Green Island is now Little Goat Island. Col Thomson’s initial defensive position was along the edge of the inlet, at the location of Thomson Park. His second position extended completely across Sullivan’s Island in the general vicinity of Station 31. The beach at the tip of Long Island closest to Sullivan’s Island in 1776 was near today’s Isle of Palms Connector (SC highway 517). Just real fine work on the maps. We should speak sometime. A new friend to your project! 3rd NC Regimental, Continental Line of Troops.